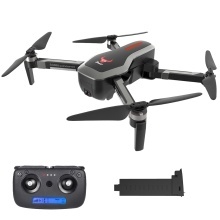 Today, we are going to introduce you with a super cool professional aerial photographing drone, which is exactly an amazing FPV drone for beginners and rc fans. With super HD 4K camera, you will gain extraordinary photos and videos shot from up sky view. Also, when you connect the wifi signal from the aircraft with your cellphone, you can realize cool functions like GPS follow, image target follow, gesture photography, path fly, POI fly and GPS positioning. This is really a very strong functional aircraft you need, come on and get one! 4K HD adjustable camera: Through transmitter, the camera can be tilted by 60°, capturing unprecedented shots from inimitable angles upon sky. High Capacity Battery: Fly up to about 23 minutes on a single charge, using the included 7.4V 2800mAh battery. Optical flow positioning: The combination of precise location by the vision position system and position hold by the optical flow positioning brings on a stable hovering for aerial shooting, allowing the pilot to pose freely. Brushless Devices: 1806 1700KV brushless motor and 30A brushless ESC guarantee a strong flying performance. Gesture photography: When you do VICTORY hand gesture or PALM hand gesture in the front of the aircraft within 2 meters, it will automatically take photo or record video for you. Follow Mode: Two following modes optional, GPS transmitter follow and image target follow, both will make the operation more convenient and fun. Path fly: Just draw a route on the screen, the copter will auto pilot as the given path.